Generally, fresh citrus fruits, like clementines, are a healthy food to eat regularly. They're full of fiber, high in vitamin C and have small doses of several minerals. With all the nutrients that clementines have to offer, you might assume you can eat as many as you want. Be careful, though. Too many of these tart fruits can be problematic. One clementine has around 1.3 grams of fiber. That might not sound like much, but if you're munching on clementines throughout the day, your fiber intake quickly adds up. Then, fiber can suddenly go from friend to foe, causing gas, bloating, watery stools or the exact opposite, constipation. 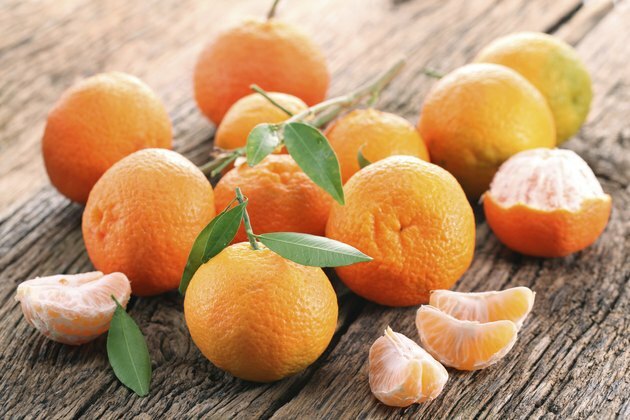 Get your daily fiber with the help of clementines, but stick to your recommendation of 14 grams of fiber for each 1,000 calorie in your diet, as recommended by the Dietary Guidelines for Americans 2010. The high acid content of citrus fruits can be damaging for your teeth. Naturally occurring acid breaks down enamel, the protective coating of your teeth. Over time if you continue to eat lots of clementines, you could experience cavities, since tooth enamel doesn't come back. If left untreated, cavities can worsen causing severe pain, bad breath and gum disease. Clementines are very low in calories, offering approximately 35 calories apiece. Although if you have a few for breakfast, a couple more as a late-morning snack, then several more in the afternoon, suddenly you're consuming hundreds of calories just from this one type of food. Eventually, the extra calories could lead to weight gain -- it takes an excess of 3,500 calories over what you burn each day to gain 1 pound. Acid reflux occurs when contents of your stomach move upwards into your esophagus, rather than down into your small intestine. It's not that eating too many clementines will lead to acid reflux, rather eating a lot of high-acid citrus foods can worsen symptoms if you're already prone to having heartburn. Not only is acid reflux painful, it can permanently damage the lining of your esophagus, leading to ulcers and bleeding in your digestive tract.